If you wondering how to thank the bus driver then you've come to the right place. If your wondering why you'd want to , or even how it's a thing then we've got you covered as well. "Since I was just a boy I have always loved jumping out of the battle bus but all this time I have felt something was missing. And that thing is the ability to thank the driver of the battle bus, he or she is truly a great person and they provide us a great service, I think it is time we can truly appreciate their service, don't you agree?". The petition's long gone now but people agreed in their droves. As a result Epic listened and have added the feature. You might have noticed the stream of 'so and so thanked the driver' messages while you were waiting to jump from the battle bus. To get in on the action, just tap down on the d-pad before you jump. It doesn't do much yet, save for maybe a warm feeling in your heart for kindness shown to a fiction entity, but who knows? Maybe it'll be a challenge later on down the line. 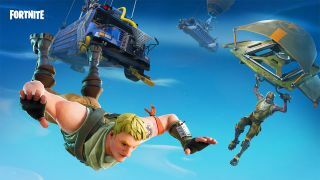 If you want to informally thank more pilots and drivers in other battle royale games, check out the best games like Fortnite to tuck into right now.